On Friday too, the rupee had lost 15 paise to end at 68.83 against the resurgent dollar. A weak trend in Asia coupled with sell-offs on Wall Street last week and a slump in the Turkish lira dampened the sentiment globally, brokers said. The rupee tumbled 79 paise against the US dollar to its lifetime low of 69.62 in early trade as Turkey's financial turmoil fuelled fears contagion might spread to other emerging markets. The currency's previous record low stood at 69.13 on July 20, 2018. Increased demand for the US currency from importers and banks amid fresh foreign fund outflows mainly hit the rupee sentiment, forex traders said. On Friday too, the rupee had lost 15 paise to end at 68.83 against the resurgent dollar. "Emerging market currencies have declined sharply as Turkish lira has fallen to all time low level after US president Donald Trump imposed sanctions and tariffs on Turkey. The crisis is unlikely to resolve anytime soon. An absence of aggressive intervention by the RBI has also hurt the rupee. Market is nervous ahead of India's CPI data due later today. The dollar has strengthened to multi-month high on expectations of aggressive interest rate hikes by the Federal Reserve in coming months as the US economy is experiencing strong growth momentum. 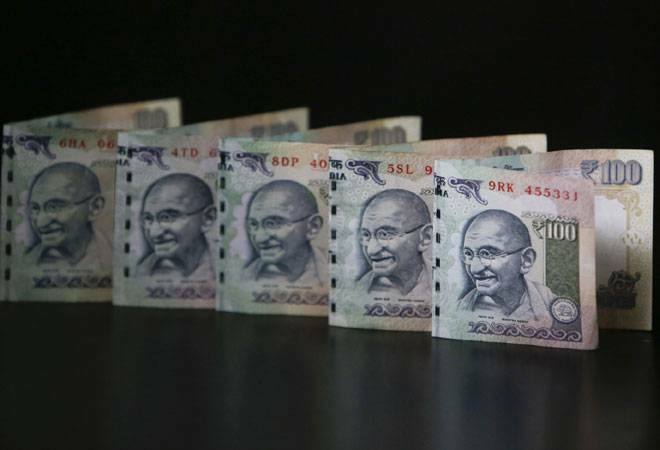 Hence, due to all these factors, the rupee has declined to all-time low level today," Rushabh Maru, Research Analyst at Anand Rathi said. Investors are uneasy over whether Turkey's government can cope with a plunging currency, a diplomatic spat with Washington and other problems. President Recep Tayyip Erdogan has accumulated more and more control over Turkey's financial system and central bank. US President Donald Trump said Friday he will authorise higher tariffs on Turkish steel and aluminium. That came after Turkey put an American pastor on trial on spying charges. Erdogan promised Sunday his government will take unspecified "necessary actions" to calm markets. A weak trend in Asia coupled with sell-offs on Wall Street last week and a slump in the Turkish lira dampened the sentiment globally, brokers said. Meanwhile, the Sensex fell over 288 points and the Nifty dipped below the 11,400-level in opening trade today on heavy losses in PSUs, auto, metal and banking counters amid a global rout in equity markets. Asian stock prices were trading lower on fears that financial crisis in Turkey could spread to other economies. The Shanghai Composite Index lost 1.7 percent to 2,746.90 and Tokyo's Nikkei 225 retreated 1.9 percent to 21,885.45. Hong Kong's Hang Seng shed 1.8 percent to 27,850.55 and Seoul's Kospi retreated 1.6 percent to 2,249.65. Sydney's S&P-ASX 200 declined 0.5 percent to 6,246.80. Benchmarks in New Zealand, Singapore, Bangkok and Kuala Lumpur also fell.